Bernice “Bunny” Ann (Gartland) Regan, 91, of Elmwood Park, NJ passed away on Sunday, April 22, 2018 at home surrounded by her loving family. Born and raised in New York City, she resided in Elmwood Park for 64 years. Bunny earned an Associate’s Degree in Graphic Design. An active and faithful parishioner of St. Anne R.C. 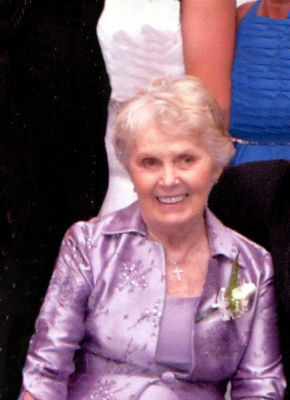 Church in Fair Lawn, she was a 50 year member of the choir and Rosary Society, served as an Extra Ordinary Minister of Holy Communion, CCD teacher and substitute teacher at St. Anne’s School. A talented woman in so many ways, she sang at many functions including weddings and the Memorial Day Parade, designed dresses and painted with oil paints and water colors. Beloved wife of Michael Joseph Regan. Loving and devoted mother of Debra Piccirillo and husband Stephen, Michael J. Regan, III and wife Kristan, Thomas J. Regan and wife Kathleen, Christi Regan and partner John Rehberger, Ann Marie Sheehan and husband Michael and James P. Regan and wife Catherine. Cherished grandmother of 19 and great-grandmother of 12. The family will receive relatives and friends Wednesday, April 25, 2018, 3-7 pm at Vander Plaat-Caggiano Funeral Home, 13-31 Saddle River Road, Fair Lawn, NJ. A Mass of the Resurrection is planned for Thursday, April 26, 2018, 10:30 am at St. Anne R.C. Church, 15-05 St. Anne Street, Fair Lawn, NJ. Interment will follow at The Cemetery of the Ascension in Monsey, NY. Heaven gained a wonderful saint and the celestial choir gained a talented soprano with your passing, Mom. We will miss you here, but have hope that we will see you, and hear you sing again in heaven. Say hello to Jesus for us. We love you!